In the mid-16th century, Elizabeth I’s government came up with a series of measures to deter “divers evil persons” from damaging the reputation of English coinage and, with it, the good name of the nation. The Royal Mint announced last month that in 2017 it will introduce a new £1 coin, said to be the “most secure coin in the world“. The reason behind the decision, which could cost businesses as much as £20 million, is the surge in counterfeiting. It is estimated that around 3% of £1 coins are fakes with an estimated 45 million forgeries in circulation. Four and a half centuries ago, Elizabeth I made the reform of currency one of her government’s top priorities. Invested as queen in 1558, she inherited a coinage which was fraught with problems. Elizabeth’s father, Henry VIII, had authorised a series of debasements which meant that in the space of just seven years the silver content of English coins was reduced by more than 80%. Counterfeiting was rife, with contemporary reports claiming that a great multitude of “noythy [naughty] money” was in circulation. Research by Jennifer Bishop, a PhD candidate in Cambridge University’s History Faculty, looks at 16th-century perceptions of coinage on an everyday level: on the street and in the market place where the bulk of transactions took place at a time when prices were rising and good monies were scarce. A good coinage was important because it provided the basic standard on which most transactions and reckonings were calculated in 16th century England. Over and above that, the status of the country’s coinage reflected its reputation on the international stage and the authority and competence of its government. Debasement of the coins in circulation wreaked havoc in the marketplace: at one time the shilling, the original value of which was 12d, was worth half its value at 6d and at its lowest point traded for just 2¼d. “Many contemporary commentators identified the debasement of the coinage as a root cause of England’s economic problems, and they also went much further linking it to widespread social disorder, disruption and popular unrest – and the corruption of English towns and local government – with coinage being deeply symbolic of the health and prosperity of the nation,” said Bishop. The restoration of “good monies” was seen as a panacea for the country’s ills, and recoinage became one of the chief aims of Elizabeth I’s regime. As well as putting an end to debasement, the government set out to tackle counterfeiting. Royal proclamations warned that “counterfeit and false moneys” were being produced “in great and notable sums” and circulated throughout the realm by “divers evil people”. Currency crimes ranged from counterfeiting to clipping, melting, washing and trafficking in coin. Collectively these illicit practices were known as coining. Today all UK coinage is made by the Royal Mint in Llantrisant, South Wales. In the mid-16th century, there were as many as eight Royal mints licensed to strike coins. Outside the mints, counterfeiting was widespread and practised by all manner of “naughty persons”. Records noting the occupations of arrested counterfeiters (punishment for those found guilty of the most severe crimes was hanging) reveal that the came from a wide range of social groups – from gentlemen to servants. “Counterfeiters included goldsmiths and metalworkers. Some counterfeit coins were so skilfully made that they were hard to spot, especially when the official coins in circulation were of such poor quality. Records in the State Papers show that one arrested counterfeiter, James Powell was so confident in his coining abilities that he offered to make tools and instruments for use by the royal mint,” said Bishop. The coins worst affected by debasement were shillings, otherwise known as testons, which posed the greatest challenge in restoring public faith in the coinage. 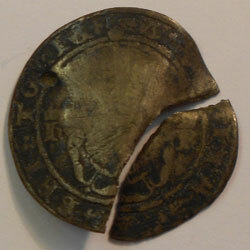 Because some testons in circulation were baser (containing less silver) than others, it was decided that they would be given two different rates: the “worse” sort of testons valued at half the “better” sort. The base testons bore a distinguishing mark – fleur de lis, rose, lion or harp. 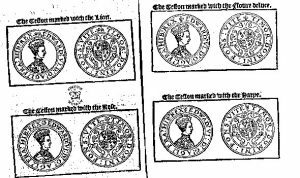 Just as today the Bank of England offers tips on how to check the validity of the £1 coin in your pocket, and what to look for in forgeries, so the Elizabethan government issued visual aids to help people identify the base coins. Confusion about which coins were better and which worse led to the regime taking a further measure in 1560. Stamping irons were sent out to the mayors of towns: better testons were to be stamped with a portcullis and worse ones with a greyhound, with the process taking place in public for all to observe. “This show of openness was important because during the debasement period there had been rumours about the dishonesty of mints officials who were suspected of manipulating the coinage for their own benefit,” said Bishop. It was thought that many of the counterfeit coins had been forged overseas and smuggled into England; several proclamations warned against “conningge” foreign coiners and “strangers dwelling in foreign parts”. On the other hand, overseas craftsmen (from Germany and the Low Countries) were much in demand for their superior metallugical skills. 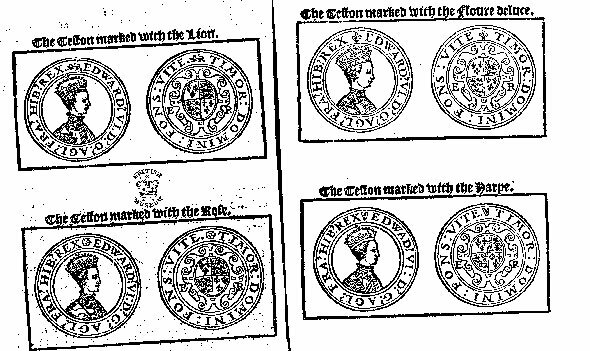 When Elizabeth decided to reform the coinage in 1560, she hired a team of German coiners to come to London and work in the royal mint. Their presence was resented by a number of English mint workers and refiners who complained that “straungers” were being unfairly favoured. A French-made machine for minting coins, which would replace the old method of manual minting, was resisted by English coiners who feared the loss of their jobs. A royal proclamation announced that the Queen had achieved the “victory and conquest of this hideous monster of the base moneys.” A commemorative medal was struck to make the recoinage, with a portrait of Elizabeth on the obverse. This entry was posted in History, Money. Bookmark the permalink.